This short post will provide some PowerShell scripting to let you play with class instances in SCOM. Since there’s not much information on the web on this topic and I had a request from a partner I will provide some code below how to handle this. In the examples below I will use a class from the OpsLogix VMware management pack, but you can use any (public) class you want. All code just be run on a SCOM MS server. All examples are separate runnable. In this case the Host we want to add is called “My_ESX_Host” and we set the “AssetTag” to “unkown” . Below we change a property called “AssetTag” to “test tag 123” of the ESXHost class instance “My_ESX_Host”. Keep in mind that only NON-Key properties can be changed. In this example we delete the ESXHost class instance “My_ESX_Host”. You added the certificate also to the Trusted Root Certification Authorities on the server. So the cert chain will be valid ! And succeed! You get the expected results. Invoke-RestMethod : The underlying connection was closed: Could not establish trust relationship for the SSL/TLS secure channel. You try the same PowerShell on the external workstation. And it works …..
You create a PowerShell script and want to include this script using the $includeFileContent/<script_name>$ tag. The FixTopNQuery.ps1 is a PS script added to the project as “Embedded Resource”. Error 1176 The configuration specified for Module Probe is not valid. Do not start a parameter name with $Data in the powershell script. It looks like it’s a reserved word in VSAE. I will share this issue also with the VSAA product team. How do i read out the IsManagementServer property on the example below ?? How do I read it out ?? Yes I know I blog a lot on SCOM related posts but this don’t imply that I don’t use the other system center products. As you know or not know that I work for a company that hosts SCOM as private clouds. So I use also a lot of Orchestrator runbooks to automate the boring and complex hand work and to glue all the components together. As one of my best practice rules I try to use only the out of the box delivered actions (IPs). Some times I can’t find the correct action and have to use PowerShell to get it working. So I use the Run Dot Net Script PowerShell action. And now the bad marriage starts. You all know when you try to type the PowerShell code into the action window you get very strange line breaks and you completely miss the code IntelliSense and error/debug features that you will have in power shells ISE or other PowerShell editors. So what do you do ? (1) Open the PowerShell editor lets say ISE and program your script. (3) Now you copy and paste your PowerShell code from the ISE editor to the orchestrator PowerShell action. (4) you replace the the input parameters with the correct orchestrator subscriptions. (5) you check-in the runbook. After some thinking I came with a solution. I have made a PowerShell ISE plugin that does the following. 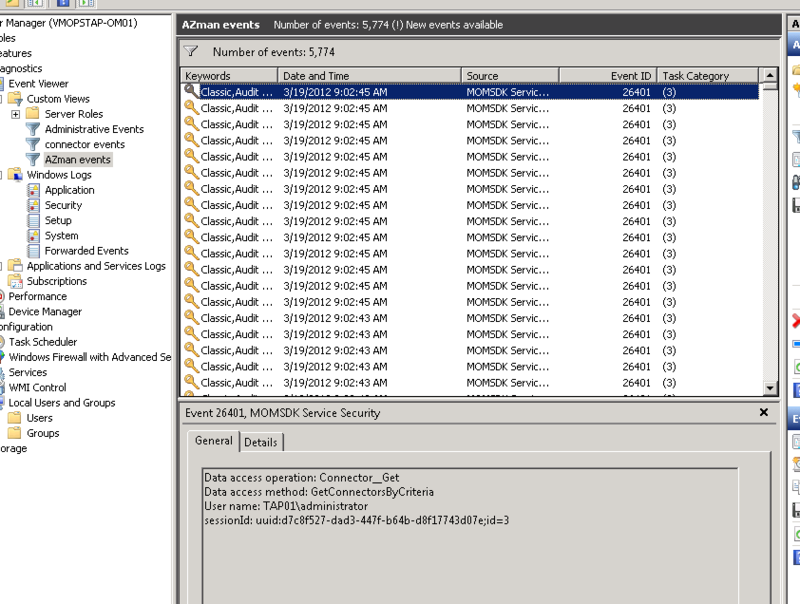 (1) connects to the Orchestrator database . You must supply the connection settings in the Config tab first. (3) You select the correct PS action by double click on it. 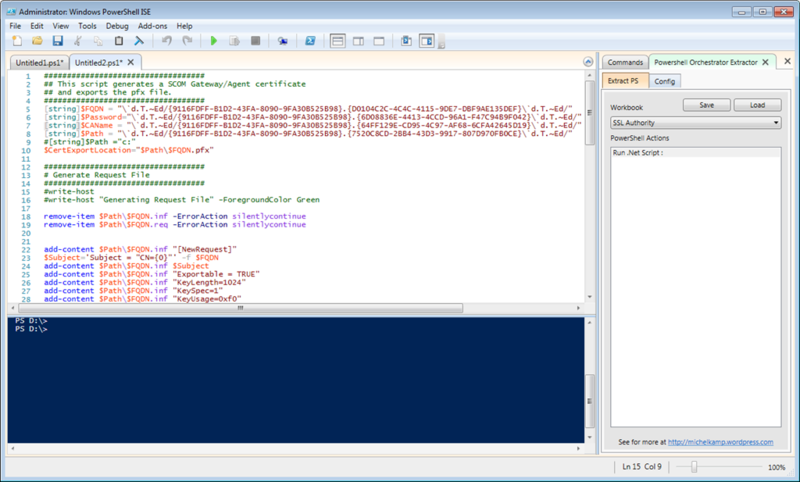 (4) the PowerShell code from that action will be opened in the ISE editor. (5) the subscription parameters are collected also and a extra PowerShell code is created for you to fill in the parameters with values for off site testing. *Planned for next release. (6) you bug fix and test the script. Now you will have the workbook action with the fixed script. You even don’t have to worry about the parameter subscriptions because the are all there… Press refresh in the Orchestrator designer and look at the properties again to check it out. And that’s why I also share it with the community ! 1) unzip the file and read the readme.txt file for setup instructions. 2) go to the config tab and specify the correct SQL and DB. Remember its using integrated security.